"AZ-1" redirects here. For the aircraft, see AZ-1 Marvelette. For the car, see Autozam AZ-1. Arizona's 1st congressional district - since January 3, 2013. 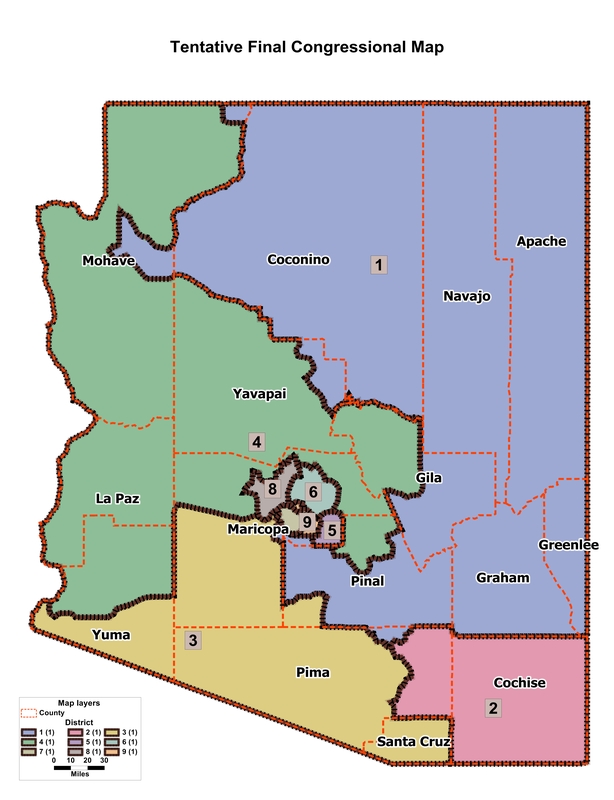 Arizona's 1st congressional district is a congressional district located in the U.S. state of Arizona. Geographically, it is the tenth-largest congressional district in the country and includes much of the state outside the Phoenix and Tucson metropolitan areas. Since 2013 it includes the Navajo Nation, the Hopi reservation and the Gila River Indian Community, with 25% of the population being Native American. Some 25% of the population of the district is Native American, primarily Navajo, Hopi and Pima. The district has more Native Americans than any other congressional district in the United States. It is currently represented by Democrat Tom O'Halleran. When Arizona was first divided into congressional districts as a result of the 1950 Census, the 1st District comprised all of Maricopa County, home to Phoenix, while the rest of the state was in the 2nd District. In a mid-decade redistricting resulting from Wesberry v. Sanders in 1967, the 1st was cut back to eastern Phoenix and most of what became the East Valley. Over the years, the 1st's share of Phoenix was gradually reduced due to the area's explosive growth in the second half of the 20th century. However, it remained based in the East Valley until Arizona picked up two seats in the 2000 U.S. Census. 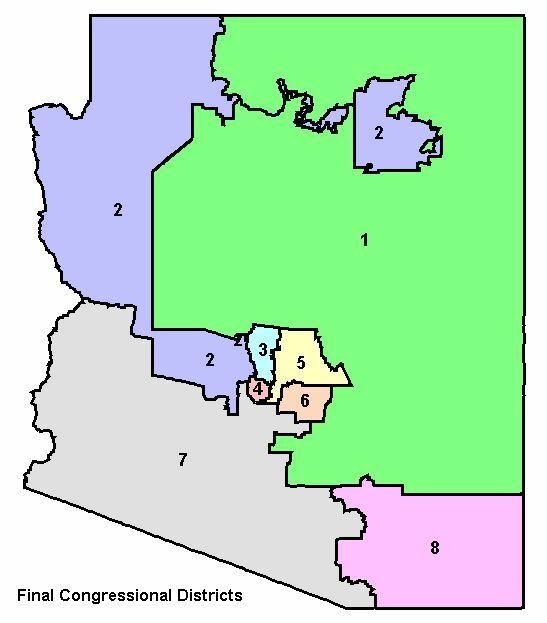 The old 1st essentially became the 6th District, while a new 1st District was created to serve most of the state outside of Phoenix and Tucson. After the 2012 redistricting, the Hopi reservation was drawn into the 1st District; it had previously been included within the 2nd District. Also included were some northern suburbs of Tucson that had been in the 8th, as well as a tiny section of Phoenix itself near the Gila River Indian Community. Meanwhile, heavily Republican Prescott, the old 1st's largest city, and much of surrounding Yavapai County were drawn into the new, heavily Republican 4th District. The district is now considered to be significantly more competitive for Democrats. This large congressional district covers the mainly rural areas of northern and eastern Arizona. Democrats perform well in Flagstaff, Sedona, and the Navajo Nation among Native Americans, while Republicans are strongest in the more rural white areas. Elections are usually decided by conservative "Pinto Democrats" throughout the rural areas. Due to its vast size, it is extremely difficult to campaign in and has few unifying influences. George W. Bush received 54% of the vote in this district in 2004. John McCain also carried the district in 2008 with 54.4% of the vote while Barack Obama received 44.3%. In the 2012 presidential election Mitt Romney (R) won with 50% of the vote, with Obama receiving 48%. Due to intense competition, this is generally considered a swing district. The redistricting has increased the number of historically Democratic voters. During the Super Tuesday, February 5, 2008 Arizona Democratic Primary, the district was won by Hillary Clinton with 48.5% of the vote, while Barack Obama received 42.2% and John Edwards took 5.0%. In the Arizona Republican Primary, the 1st District was won by McCain with 46.0% while Mitt Romney received 35.2% and Mike Huckabee took in 11.7% of the vote in the district. Tom O'Halleran (D) won the congressional seat in 2016. The district was considered very competitive for both parties in the 2016 primaries and general election. Arizona gained a second congressional seat after the 1940 Census. It used a general ticket to elect its representatives until the 1948 elections, when candidates ran from each of the districts. 82nd Redistricted from the at-large district. 89th First elected in 1952. 99th First elected in 1982. January 3, 1995 103rd Elected in 1992. 106th First elected in 1994. Retired to run for Governor. January 3, 2003 107th Elected in 2000. 110th First elected in 2002. January 3, 2011 111th Elected in 2008. January 3, 2013 112th Elected in 2010. 114th First elected in 2012. As of August 2018[update], there are six living former members of the House from the District. The most recent representative to die was John McCain (served 1983–1987) on August 25, 2018. ^ "Can Navajo Nation help rescue endangered Dem Congresswoman?". ABC News. October 8, 2010. This page was last edited on 24 January 2019, at 16:20 (UTC).